The Remaining Useful Life (RUL) of an asset is the estimated length of time remaining before it will need to be replaced. Determining an accurate remaining useful life for an asset is an important step in determining when the asset should be renewed. Obsolescence may also be an issue in some cases. The Australian Infrastructure Financial Management Guidelines suggest that an asset's age should be used to determine its remaining useful life in the early part of its lifecycle, and that condition should be used near the end of its life after signs of distress have become evident. 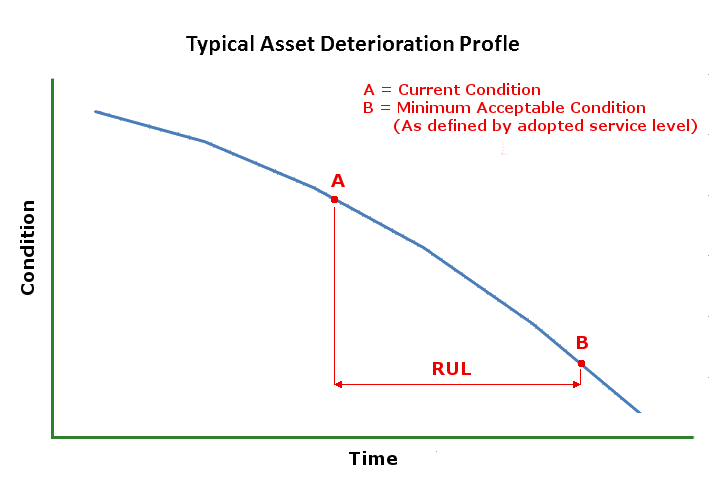 The relationship between the score assigned and RUL may vary depending on the deterioration profile of the asset type being considered, but the table below gives some indicative figures.